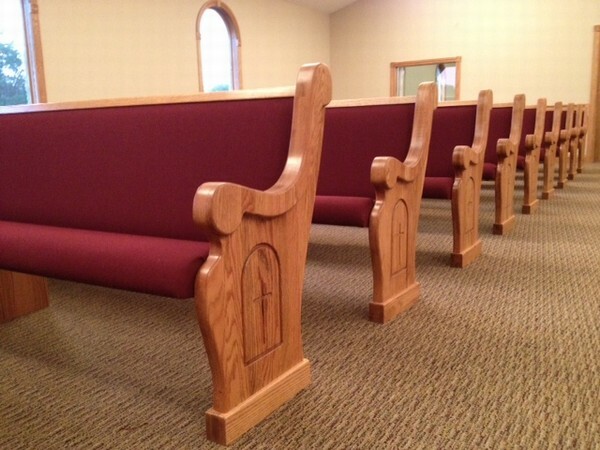 At Born Again Pews, we make a variety of custom tables, including communion tables. All of our tables are made out of solid oak which means they’ll last through generations if cared for properly. Just like all of our other furniture items, we can customize your communion table however you’d like and even match it to your church pews. Oak has been used for centuries for furniture for a reason–it’s a hardwood that stands up to lots of abuse and has a nice looking grain and pattern to the wood. Oak has been used for interior paneling in fine buildings, making ships since the time of the Vikings, and for beautiful furniture wherever oak trees grow. Oak is perfect for all these uses because it’s a beautiful and hardy wood. You want your communion table to be beautiful and sturdy, built for decades of use as a special part of your church’s furniture. To make sure that your communion table stands the test of time, you’ll want to take care of it. We finish all of our furniture with Minwax finishes that have been proven to help wood retain its luster and grain. But there are a few others things you can do to ensure your solid oak communion table stays in perfect shape. You’ll want to make sure that water isn’t left standing on the oak and that any spills are cleaned up. Oak can take a beating but water can damage the wood because oak absorbs water well. On the other hand, you don’t want your wood to dry out. Always use a cloth dampened with polish or teak oil to wipe down your oak communion table. Minwax makes a line of care products that pair well with their finishes. With appropriate care your church table will last through generations so you’ll want to make sure it fits your church perfectly. We can customize any communion table to match your church pews in style and color. Many churches also like to have a special carved phrase to indicate the communion table’s special status, such as “Do This In Remembrance Of Me.” Just like everything else, this phrase is completely custom and we can carve whatever you find best into your communion table. If you’re shopping around for a new communion table, church pews, or both, we can help so give us a call and we’ll provide a free estimate for your church. Call us today at (877)739-7453!